Despite material disadvantages, Georgia’s hockey team is moving up the charts. “That’s where we broke the window,” says Mikheil Davitashvili, a defenseman and general manager of Georgia’s national ice hockey team, pointing to a puck-shaped hole 7 meters above. “As you can probably tell, this isn’t a convenient place to train professionally.”The team currently practices at an old Soviet figure-skating school. The rink is smaller than a standard hockey rink, with no boards along the side – so limited checking – and the team has to bring its own net, a self-assembly version normally reserved for pond hockey matches. Hockey rinks should have safety barriers on the side, but this facility doesn’t, so during one slap-shot practice an errant puck flew out of the rink. Despite these material disadvantages, Georgia’s hockey team is on the rise. This past April, at the 2018 International Ice-hockey Federation (IIHF) Division III World Championship in South Africa, Georgia delivered convincing victories over Turkey, Bulgaria, Hong Kong and Chinese Taipei, falling only to the hosts. The performance won Georgia gold and earned the team a promotion to Division II for the next season – an impressive result for a team that played its first IIHF match only five years ago. Much of Georgia’s hockey success is due to Davitashvili and his uncle, Denis Davidov, an amateur ice hockey player in Soviet Georgia who introduced his nephew to the sport at an early age. Now, at just 26, Davitashvili is unusually young to be the team’s general manager – a role usually reserved for people twice his age. The substandard rink is only one of the obstacles the team is overcoming. Attracting sponsors has also proved difficult, with the players often working unpaid. Ice hockey stadiums were relatively widespread in the USSR, and though it was never a major sport in Georgia, Tbilisi at least had a stadium and a local league. Following the dissolution of the Soviet Union, however, Tbilisi’s stadium fell into disrepair and was eventually torn down. Despite this, Denis Davidov and Lasha Tsagareishvili, two amateur enthusiasts, started playing hockey again in the late ‘90s. In 2004, they founded the Georgian Ice Hockey Federation – the governing body of ice hockey in the country – laying the groundwork for Georgia’s accession to the IIHF five years later. But disaster struck. Weeks after getting Georgia accepted into the IIHF, Tsagareishvili and Denis Davidov were killed in a road accident. The sport would have to wait. It wasn’t until 2014 that Davitashvili would take his uncle’s mantle and Georgia’s national team would mark its international debut in the third division. Their first opponent: North Korea. They didn’t expect victory, but the scale of the beat-down was disheartening. Pyongyang scored six times in the first period en route to a 22-1 victory. It was an inauspicious start. That same year, Georgia was defeated by three of the four lowest-rated teams in the world rankings, but Davitashvili puts this down to growing pains. But Georgian hockey is growing. Today, there are over 500 players registered in the country, although all are amateurs and they include chefs, accountants and CEOs. The national league now includes four teams across the country: Fiery Crusaders, Grey Wolves, Ice Knights and Mimino. The country also will send its first player abroad to train this fall: 18-year-old Temuri Vedyapin recently signed with the Maniwaki Mustangs of the Canadian Premier Junior Hockey League (CPJHL). While the CPJHL is a new and untested junior league, it aims to train players for collegiate programs in the United States, from where professional players are regularly drafted, and so represents a significant milestone for Georgian hockey. That money doesn’t go far. “We paid 63,000 lari on flights alone for the championships in South Africa,” Ilia Davidov, the president, says. The lack of training venues also presents difficulties, with professional training only possible in Batumi, Kutaisi and the ski resort town of Bakuriani. “The stadium in Bakuriani is standard size, but as an outdoor stadium it’s only active for a few months a year,” Davitashvili explains. “Batumi has the best rink, but it’s 400 kilometers away.” Some members of the team practice abroad, in Finland, Germany and other countries, but this isn’t financially viable for everyone. 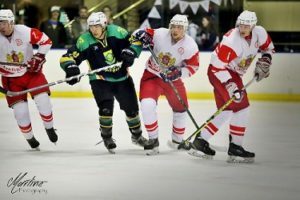 Although ice hockey is beginning to reach Georgian youth, the price to enter the sport is still prohibitively high for a country with an average monthly income of about $400.